How do you know when your horse needs its teeth checked? Quite often they tell you, but you might mistake it for bad or odd behavior. You may discipline it or put on a noseband to make it mind the bit. Or, you may change bits, put on martingales or tie downs or other gear designed to keep your horse’s head where it belongs. You may change feeds or buckets or other aspects of your horse's environment. But, your horse could be acting up or doing strange things because it is experiencing discomfort and pain. Ideally, your horse’s teeth should be checked by a professional at least once a year. Learn the signs that it is time to call an equine dentist or veterinarian to check your horse’s teeth even if it has been less than a year. A horse that fusses with the bit may be reacting to discomfort caused solely by the bit, or as with head tossing, dental problems that make holding the bit uncomfortable. Sometimes extra teeth could be the problem and your horse might need a bit seat or teeth removed. Quidding is when a horse spits out balls of hay it has already chewed. You can learn more about the causes and effects of quidding. A horse that quids is not swallowing its food properly. This can cause the horse to lose conditioning as its full nutritional needs are not being met. Head tossing can mean a sore mouth. There are a few reasons your horse might toss its head when you ride it. It may be reacting to how you use your reins. It could have problems carrying the bit, or it may have dental problems that cause it discomfort all of the time or just when it wears a bit. If your horse cannot chew properly, it will not be able to extract all the nutrition it needs out of fibrous fodder like grass or hay. Bad teeth can contribute to weight loss. A horse that cannot chew properly is also prone to choke and impaction colic. If your horse has broken teeth, infected gums, sore cheeks or any other discomfort in its mouth caused by dental problems it may chew its food very slowly. This can lead to weight loss and poor nutrition, especially if it is rushed in any way, say by other horses, that want to steal its food. Pain can make a horse less responsive to the bit. Some horses have no tolerance for pain and will act out by becoming resistant. Some will act in the opposite way by becoming spooky and likely to bolt at every opportunity. Others will be quite stoic, and will put up with a lot, which is why regular dental care is important. A horse that eats by spilling or throwing grain all over may be anxious about its food. Also, it might be trying to keep an eye out for any other horses that try to steal it. Or, because of dental problems, the horse may just have a difficult time holding the grain in its mouth and chewing. Because the grain might not be ground up properly, choking can result. If there is a bad odor coming from your horse’s mouth or nose, suspect an infection of the gums or elsewhere in the mouth. This might be the only sign that there is a problem that might have to be treated with dental work and antibiotics. Horses drool or slobber because they have eaten plants with fungi that makes them drool or after ingestion of an irritating substance. Also, something might be embedded in the gums, tongue, or palate, or the horse might have a dental problem. Some horses drool when they have the bit in, and it is pretty normal. But if you are not sure, it is probably time to call a vet or equine dentist. 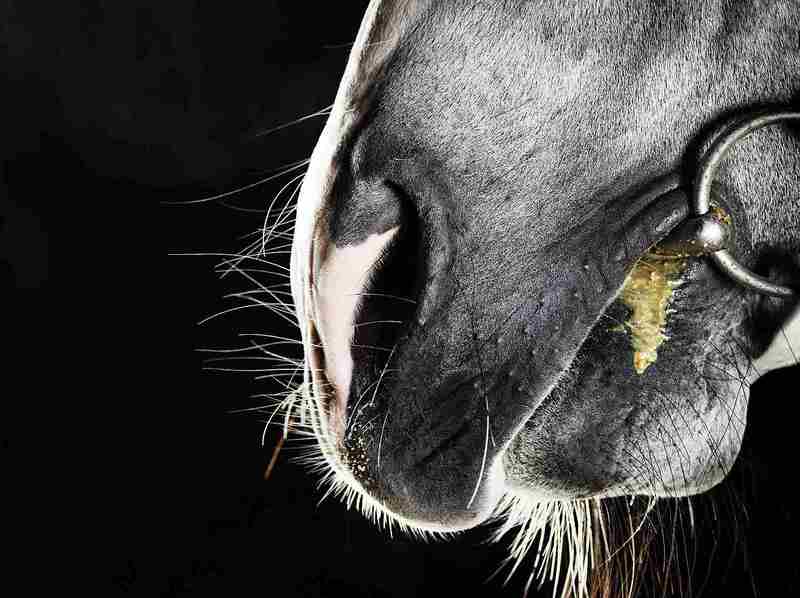 A small trickle of clear or slightly milky fluid is normal from your horse's nose. A yucky running nose can be a sign not only of a sinus infection but of a dental infection. Your vet will help you find the cause of discharge and advise you on the best treatment. If your horse is head shy and will not let you touch, groom, or put the bridle on, then a painful dental problem could be the cause. Horses with bad dental problems may be hesitant to drink cold water. Lack of water can lead to choke and impaction colic along with difficulty getting all the nutrition it needs from its food. If you suspect a dental problem it might be wise to wet your horse’s feed and provide warmed water until a professional can help you sort out the problem.